There are fears in India about the impact of a move to cut corruption by replacing the country’s major banknotes could spread wider and last longer than first thought, with warnings economic growth and food production will suffer. 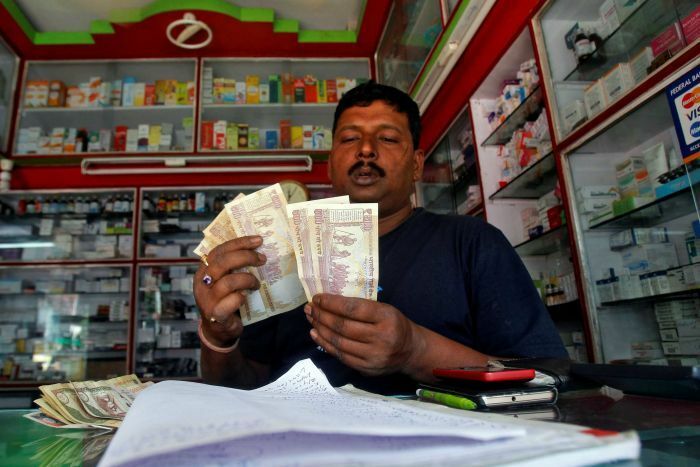 In rural India, the promised “short term” pain of currency change is creeping into winter. The northern state of Bihar is one of India’s poorest. In the village of Bakhtiyarpur, farmer Rajgir Rai and his son want to buy seed for a winter wheat crop, but cannot. “When I give a 500 rupee note to somebody, he tells me to first ‘go get it converted’,” he explained, waving the worthless bill in frustration. Several weeks ago India’s Prime Minister Narendra Modi cancelled 500 and 1,000 rupee banknotes overnight. But an ongoing inadequate supply of replacement currency means like many rural Indians, Mr Rai still cannot get new notes. Mr Rai said farmers like him depended on cash from selling one crop to plant the next. “We cannot use the money that we have earned anymore,” he said. As his staff weigh orders, all for fewer or cheaper seeds, store owner Shailender Kumar told Saturday AM his business was down 60 per cent. “Our season starts at the beginning of November,” he said. Rendering trillions of rupees worthless has caused enormous upheaval across India, yet it remains popular, as Indians support curbing rampant tax evasion and corruption. But there is also growing anger over impacts the Government appears not to have anticipated. In Parliament on Thursday, former Indian prime minister Manmohan Singh launched a scathing attack on the Government’s handling of its policy, saying it had been “monumentally mismanaged”. Delays in replacing the cancelled notes “reflect very poorly” on Prime Minister Modi’s team, finance ministry and India’s Reserve Bank, he said. As he tilled his soil, frustrated farmer Sunil Kumar said despite good monsoon rain, he expected his forthcoming crop to disappoint. “I had no cash to buy new seed, so I resorted to using the seed I had at home,” he said. He could not afford decent fertiliser either, and knows yield and quality will suffer as a result. “When I go to sell this crop, I won’t get the usual market price,” he lamented. In belated recognition of the potential economic and food supply consequences, the Government has offered farmers seeds on credit. But none of the farmers the ABC spoke to were aware of that offer. The potential ripple effect has analysts estimating the currency change could wipe as much as four percentage points from India’s 7.6 per cent annual growth. But not all are entirely pessimistic. “This quarter could be 30 to 40 per cent down,” Indian agricultural economist Ashok Gulati said. What few are willing to predict however, is if the pain will be worth it.